With any new handheld console, there is the inevitable rush to provide accessories, a deluge of unnecessary plastic objects vies for attention, some good, some not so. 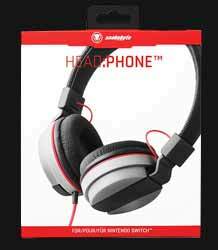 The HEAD:PHONE from Snakebyte are a set of headphones designed to complement the Nintendo Switch. Out of the box the phones' design, the grey and red, will complement your console well. The phones come folded, which in this configuration will help with storage, and the angled speakers are well protected. The build felt a little light but also felt as if they would be hard wearing. 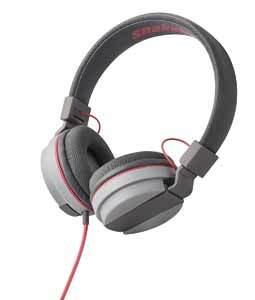 When I popped them on they were surprisingly comfortable as the speakers and head bar are padded and the overall elasticity hugs the head without you feeling undue pressure. Although the set is designed for use with the Switch I tested them out with various music tracks to see how they responded. The first thing you notice is the pleasant inclusion of a good bass response, they also demonstrate nice fine detail and separation. If they have a fault it’s a minor lack of warmth in the overall sound, but then given they are designed as gaming headphones they are more than up to the job. I’m guessing that a lot of parents will be looking for headphones for the kids to wear and the set has one more attractive design, the headphones comes with a jack to connect another set, allowing both of your angels to use the same console at the same time with no arguing. Of course, you’ll have to fork out for another set of headphones to plug into the first, but I’m guess the resulting silence will indeed be golden. Ultimately, it's a decent set of phones at a decent price that has the benefit of being able to have another set connected to it for those long car journeys.